Robert Kingston Scott was born on July 8, 1826, the son of John and Jane (Hamilton) Scott, in Armstrong County, PA. He received an elementary education in common schools, and at the age of 16 years old, he went to Ohio and attended Central College for a while, then studied medicine at the Starling Medical College in 1850, then went to California. There he tried his hand at mining for gold, then practiced medicine for a short duration. After a brief prospecting tour in Mexico and South America, Scott returned to Ohio in 1851 and settled in Henry County, where he practiced medicine. His investments in land made profitable returns, which enabled him to gradually withdraw from medicine. From 1857-1861, he was engaged in "merchandizing." He married Rebecca Jane Lowry and had at least two known sons. In 1861, Ohio Gov. William Dennison, Jr. appointed Dr. Robert Kingston Scott as a Major, with instructions to organize the 68th Regiment of Ohio Volunteers. He took part in the reduction of Fort Donelson, the battle at Pittsburg Landing, and the Siege of Corinth. In July of 1862 he was promoted to full Colonel, and on October 3, 1862 he was assigned to a brigade under Maj. Gen. Stephen A. Hurlbut, which two days later fought at the Battle of Hatchie's Bridge in Tennessee. Col. Scott received honorable mention for gallant conduct and was soon thereafter made a brigade commander. After a reorganization of the army, the 68th Regiment was folded into the 17th Corps. Col. Robert Kingston Scott commanded the advance of Maj. Gen. John A. Logan's division on the march into Mississippi, and was in the action at Port Hudson, Raymond, Jackson, and Champion Hills. During the investment of Atlanta, Col. Scott was taken prisoner, but escaped. He was recaptured and taken to Charleston, where he was later exchanged on September 24, 1864. 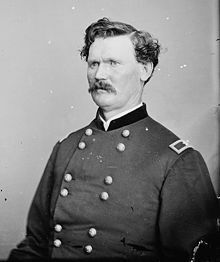 Scott was commissioned as a Brigadier General of volunteers on January 12, 1865, and also received the brevet ranks of Brigadier and Major General in the volunteer army, to date from January 26, and December 2, 1865, respectively. He immediately resumed command of his brigade and accompanied Gen. William Tecumseh Sherman in his "march to the sea." In December of 1865, Brig. Gen. Robert Kingston Scott was ordered to report to Gen. Oliver Otis Howard, who was commissioner of the Freedmen's Bureau (the Army's Bureau of Refugees, Freedmen, and Abandoned Lands), where he played a major role in the Reconstruction era of the South. On January 2, 1866, he was ordered to replace Brig. Gen. Rufus Saxton as the next Assistant Commissioner of the Freedman's Bureau in South Carolina. Brig. Gen. Robert Kingston Scott arrived in Charleston on January 19, 1866 and quickly learned that most of the state's population was in a state of destitution. He worked tirelessly to re-establish order in the state. In March of 1868, Scott was nominated by the Republican Party of South Carolina to run for governor. He formally declined but after being pressed by his many friends, he was ultimately elected by a majority of 46,000 votes. In 1870, he was re-elected with a majority of 34,000 votes. In 1871, he and other state officials were charged with a fraudulent over-issue of state bonds, but he justified his actions in a message to the SC legislature and thus defeated a resolution of impeachment. About the same time, there were Ku Klux Klan outrages all across the state, but Gov. Scott promptly suppressed them all with the aid of Federal troops. From 1872 to 1877, Robert Kingston Scott was in the real estate business in Columbia and afterwards in the same line of businss in Napoleon, OH. He died in Napoleon, OH on August 12, 1900. Robert Kingston Scott, soldier, born in Armstrong County, Pennsylvania, 8 July, 1826. His grandfather fought in the American Revolution, and his father in the War of 1812. The son received a good education, studied medicine, and began practice in Henry County, Ohio. In October of 1861, he became Lieutenant Colonel of the 68th Ohio regiment, of which he was made full Colonel in 1862. He served at Fort Donelson, Shiloh, and Corinth, led a brigade at Hatchie Bridge, TN, commanded the advance of General John A. Logan's division on the march into Mississippi, and was engaged at Port Gibson, Raymond, and Champion Hills. He was afterward at the head of a brigade in the 17th Corps, was made prisoner near Atlanta, but was exchanged on 24 September, 1864, and was in Sherman's operations before that city and in the march to the sea. He was commissioned Brigadier General of Volunteers on 12 January, 1865, and also received the brevets of brigadier and major-general in the volunteer army, to date from 26 January and 2 December, 1865, respectively. General Scott was Assistant Commissioner of the Freedmen's Bureau in South Carolina in 1865-1868, resigned from the army on 6 July of the latter year, and in 1868 became the first Governor of the reconstructed state, having been chosen as a Republican. He was re-elected in 1870 by a majority of 33,534 in a total vote of 136,608. In the autumn of 1871 the governor and other state officers were openly charged with a fraudulent over-issue of state bonds. Governor Scott justified his course in a message to the legislature, and a resolution of impeachment was defeated in that body. Much excitement was also caused in this year by Ku Klux Klan outrages, and Governor Scott's appeal to the president to aid in suppressing them, which was done by the use of United States troops. Governor Scott afterward removed to Napoleon, Ohio. On 25 December, 1880, he shot and killed Warren G. Drury, aged twenty-three years. Drury and a son of General Scott had been drinking together, and while searching for the boy General Scott met the former, when the shooting took place. He was tried, and acquitted on 5 November, 1881, the defense being that the discharge of the pistol was accidental.